Machinefabriek Krimpen was established in 1945 by its legal predecessor, “Le Noble & Co.” of Rotterdam. The company manufactured machinery and motorcar components and provided refrigeration technology. In 1952 the company, which was on the lookout for more work, received a major order from the Dutch army to produce dummy grenades. 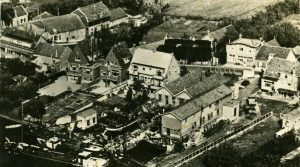 Since the existing premises in Rotterdam were proving too cramped, in the winter of 1952/1953 the company moved its operations to a new location with workshops, offices, a shipping dock and two residences in the town of Krimpen aan de Lek. The disastrous storm floods of February 1953 caused considerable damage to the newly acquired premises, and to make matters worse the government order was cancelled, although the company did receive compensation for the materials that had already been procured. During the spring of 1953 the company was plagued by power cuts resulting from the damage caused by the flooding. The cancellation of the ordnance order meant that new customers urgently needed to be found. The decision was made to invest in modern equipment, including a precision grinding machine and a gear hobber. This turned out to be a good move, and after initially working at low prices to gain a foothold on the market, the company eventually found its production schedule filled to capacity, which enabled it to operate at a more favourable price level. During that period the government became a regular customer. The ultimate goal of securing a constant flow of government orders remained out of reach however, and state procurement continued to be an intermittent process. The company’s management decided it needed a unique product to sell, as this would result in recurrent batch orders that could be produced more efficiently with fewer errors and shorter lead times. Third-party orders always have a tendency to disrupt a production process. In 1956 the company decided to change its name from Le Noble & Co. to N.V. Machinefabriek Krimpen. In 1972 the N.V. (public limited company) was converted to a B.V. (private limited company). 1970 . INDUSTRY BECOMING A MAJOR CUSTOMER. Government orders were no longer forthcoming during the 1970s and 1980s, and production focus shifted to maritime anchor winches and complete winching systems, with the dredging industry becoming a major customer. 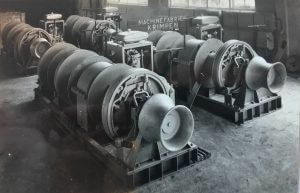 Winches require a fair number of gears, so new gear cutting machines were obtained to produce them. 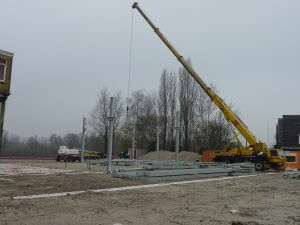 During this period, the company also did quite lot of overhaul work for customers operating from the Port of Rotterdam. 1980 . FIRST GEAR LAPPING MACHINE WAS INSTALLED. 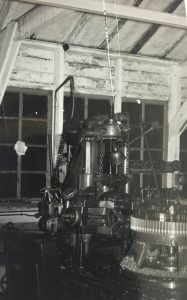 By the end of the 1980s the emphasis of the company’s operations changed to producing gears for other manufacturers, and the first gear lapping machine was installed. 1990 . COMPANY’S OWNERSHIP CHANGED HANDS. In 1990 the company’s ownership changed hands. The new owner decided to expand the existing production facilities, creating room for the purchase of new machinery. In the early 1990s the first CNC equipment arrived, and over the next few years, more gear-cutting machinery was installed, with Machinefabriek Krimpen increasingly positioning itself as a manufacturer of gears. At the start of the new millennium, new CNC and teach-in lathes were purchased, as were new CNC milling machines. 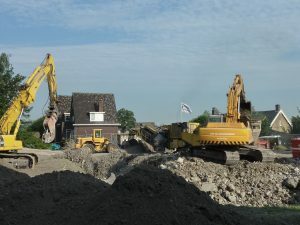 In 2007 the adjoining premises were acquired, but unfortunately the underlying soil was found to be polluted, which meant that a large-scale clean-up operation was needed. In 2010 the building was demolished and the polluted soil removed. A new production facility was built beside the existing building. With the new facility completed in 2011, the available floorspace had been doubled. The last anchor winch left the factory in 2007, competition from low-wage countries having wiped out the demand. An anchor winch is a relatively simple product, so it is easy to produce, or indeed, reproduce. To safeguard the future existence of the company, it needed to start manufacturing products that require more know-how. In addition, short lead times would help to secure orders, as customers for products with longer lead times will search the world over to find the lowest possible prices. The decision was made to refocus the company’s operations on high-tech gear production. 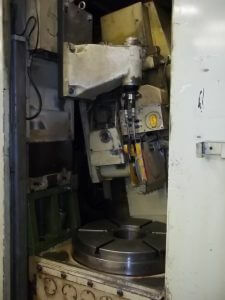 A state-of-the-profile gear profile grinding machine and a 3D gear measuring machine were acquired. The new equipment enables the company to produce and calibrate gears of extremely high quality, attracting new customers both in the Netherlands and abroad. 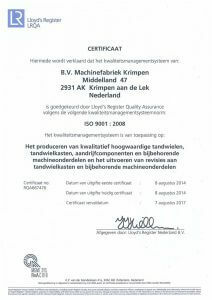 Machinefabriek Krimpen received its ISO 9001 certification in 2014.